Where was John last night at 10? 1. He may have been at his home. This is Past Tense. Right? 2. He may have been in this country for 2 years. Isn't #2 exactly same as #1? 3. The suspect may had been here. The suspect may have had been here. Ok, in this situation, I'm completely lost so far. When I tried to describe a Past Perfect situation using the STRUCTURE (modal+have+pastPartipal), the STRUCTURE doesn't seem to fit anymore. I also attached this Formula I found, but it also can't explain it clearly to me. I need someone explain to me how to use different tenses when using modal auxiliary verbs to express Past Probability. 2. Isn't #2 exactly same as #1?-- The form is the same; the meaning is not-- it includes the present moment. 3. The suspect may have been here.-- This is the correct parallel. 2 don't know what could happen. You know, the worst would have been being charged, potentially being put in jail, being separated from Sean and Amelie. Dina: You may have lost them at work. The keys are lost, and Tom doesn't know where exactly he left them, he might have left them at work, at home, or somewhere else. ( It's possible that the keys are either at work or somewhere else "
Dina: You have left them at work, on your desk. I don't think this makes any sense " The suspect may have had been here. " The Modal auxiliary verbs are always followed by the base form. It's not correct to say " May had " . Yes, you are right .. The form is " May/Might + Have + Past Participle "
The general form is " Modal + Have + Past Participle "
Sorry again for the mistake I made ..
akdom Is the "structure" MODAL + HAVE, or MODAL + HAD? Isn't that when using a verb after modals, the verb must be original form? Yes. I assume that by "original form" you mean the bare infinitive or 'dictionary form'. Only the dictionary form of a verb can occur after a modal. That includes have, but not had. The most usual modals are these nine: will, would, shall, should, can, could, may, might, must. The corresponding perfect modals are these: will have, would have, shall have, should have, can have, could have, may have, might have, must have. The modals are always followed by a bare infinitive; the perfect modals are always followed by a past participle. Of these 18, the following three are not used very often: shall, shall have, can have. Is the "structure" MODAL + HAVE, or MODAL + HAD? YoungBuddy's reply was promoted to an answer. Here are what I've learned so far. See if I got them right. Where was he last night? He may have been at his house last night. He may have been in this country for years. He may have left before we came. He may have been taking the drug for years before we noticed anything. When the cops showed up last night, what was he doing? I don’t know. He may have been taking a shower. 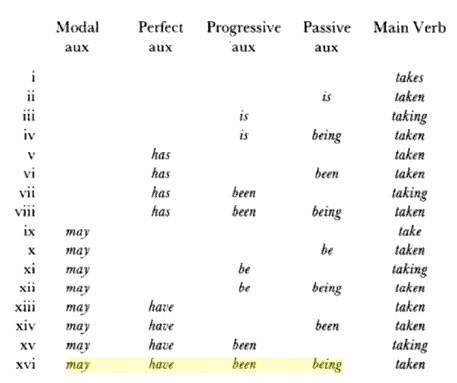 1, 2, 3 (SimplePast, PresentPerfect, PastPerfect) all have the same form Modal+Have+Past Participal. You have to see the surrounding context to determine its intended tense. Am I right? In the above cases, in order to figure out their tenses, we can NOT look at their syntax alone, because they are all similar to each other. Context is crucial. The question is in the form of " simple past " , so the answer should be as well. Where was he last night ? He was in the cinema yesterday. (Not a past probability; included present moment) >> present perfect is used to describe an action that happened in the past ( not a specific time ), that might not be finished yet. I don't think that the " Present Perfect " tense refers to a point before another one in the past. He had left before i arrived. How can we apply the " Modals Possibility " on the sentence mentioned above ?